how about jesus at summer olympics? can't wait to see him in long distance running. i think in his days, they've got something cooler. Like chariot racing. i love curling so much. good stuff. i guess this answers that whole "Glass Houses" question. No, I don't think Jesus lived in a glass house, but I could be wrong (keep in mind that it is a very rare occurrence that I am incorrect). I think this actually responds to the 'he who is without sin' question. Those people get to throw the first stone - those buggers. 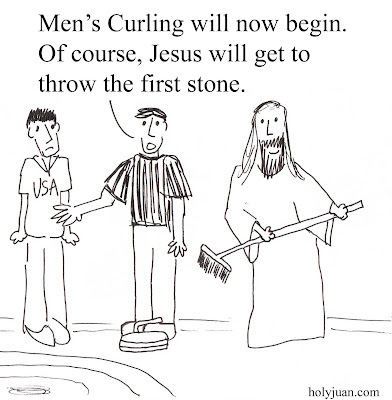 Only problem with this comic is that in Curling, you want to go last, not first. So, the USA guy should be smiling, and Jesus should be unhappy. Dan... you got me. Good catch.